WeChat is a Chinese multi-purpose messaging, social media and mobile payment app developed by Tencent. It was first released in 2011, and by 2018 it was one of the world’s largest standalone mobile apps by monthly active users with over 1 billion. WeChat is not just a messaging app but also known as China’s “app for everything” and a “super app” because of its wide range of functions and platforms. For any app to add a payment feature, the company needs to work on strategizing both the sides of a market place, getting more users feed their payment credentials in an app and getting more merchants to accept the payment from an app. WeChat solved this problem without using one of the common strategies, just by adopting a Cultural Tradition called “Red Envelope”. This not only helped WeChat convince over half of its China users to provide payment credentials, but also allowed them to do so at a very rapid pace. Which, to be clear, is an example of viral growth not network effects. But the point is that this viral growth led to other network effects in the WeChat ecosystem. Red envelopes that contain cash gifts are given as best wishes on special occasions like weddings, births, graduations, and Chinese New Year. 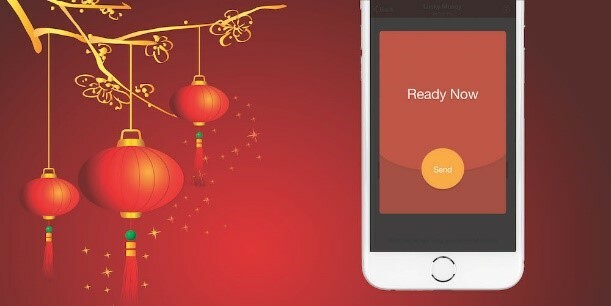 To celebrate the Chinese New Year holiday in 2014, WeChat launched a P2P (peer-to-peer) payment feature called Lucky Money, later renamed Red Packets. Two years later, over 420M WeChat users sent 32B digital red envelopes over the six-day holiday — with peak usage coming in at 409K red envelopes sent per second. Over 60M WeChat users in China continue to send Red Packets each day, not just on holidays, as they have now become their own form of social communication, similar to sending stickers or emoji. Today, over 300M WeChat users have bound their banking credentials to their user accounts. This means those users are fully enabled for one-tap payments across the entire WeChat ecosystem — from hailing a taxi and buying a movie ticket to ordering food and drinks. Which in turn incites more developers and partners to invest in the platform, which in turn creates better experiences that cause more users want to transact, and so the network effects flywheel spins on. 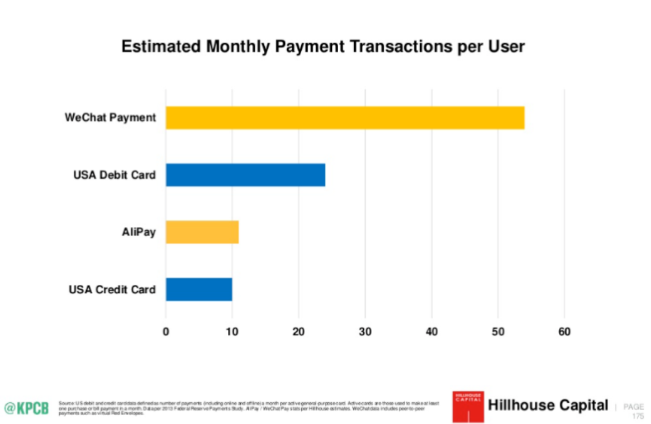 WeChat thus appears to be #1 in payments but it is leading in volume of red envelope transactions. Money has now become a message, so it’s now common for people to send even casual greetings accompanied by small amounts of money (often lucky number 8 RMB, which is about 1USD). Combining physical and digital world with cultural tradition connects with the consumers at emotional level with better acceptance and growth.